Each music interval has a quality, depending on whether it is a 2nd, 3rd, 4th, 5th etc. If an interval is a unison (1st), 4th, 5th or Octave (8th) it is called a perfect interval. Both notes in a Perfect interval are in the major scale. The example below shows the interval of a Perfect 5th. One of the features of perfect intervals is the fact that if you invert them (turn them upside down) they remain perfect. Click here to read more about inverted intervals. Perfect Intervals can also be raised or lowered by a semitone to become augmented or diminished, but for the moment all intervals of a Unison, 4th, 5th or octave in the exercises on this page are perfect intervals. A unison, 4th, 5th or octave can never be labelled as a major or minor interval (even though it is part of the major scale). Major intervals are those which are part of the major scale. The major scale should always be your starting point when working out an interval. There are 2 example below. The first showing a major 6th interval in the key of C major, the second showing a major 3rd interval in the key of E major. Minor intervals are one semitone smaller than major intervals. Minor intervals should always be worked out from the major scale. Find the major interval and lower the top note by one semitone to give the minor interval. This is because the notes in minor intervals don't always come in minor scales. E.g. Although the minor 3rd comes in the minor scale, this isn't always the case. The minor second isn't part of the minor scale. This is why it is important to remember to work out intervals from the major scale, not think of them as part of the minor scale. There are 2 examples below. The first shows a minor 7th in the key of G major, the second shows a minor 2nd in the key of D major. There are two styles of questions you may be asked about intervals. In the first style you are asked to identify an interval, either as a stand-alone question or as part of a phrase of music. You are given both notes and all you have to do is name the interval. Always remember to count from the lowest to the highest note. Even if on the music the higher note comes first. Always count from low to high. In the second type of music interval question you are given a note and asked to add the note that is a given interval higher. You need to be familiar with both of these styles of questions. 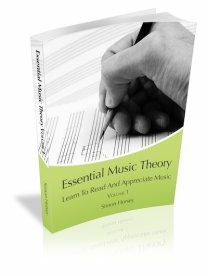 Click here to download a free music theory worksheet of music intervals questions to check your understanding. Once you have completed the exercise, you can click here to download the answers. When you see a list the intervals and their descriptors you can see it is quite easy to remember which intervals are major/minor or perfect. As you can see above the Perfect intervals are at each side, unison and octave, and in the middle, 4th and 5th. The major/minor intervals come in-between! Although learning how to find an interval may seem complex to begin with, especially as it relies on your knowledge of scales, as you practice it becomes much easier. It also helps with your sight reading and memorization of music. As with most things in music, the best way to get better at identifying intervals is to practice! Test your understanding of the quality of a music interval. Click here to take a test on the quality of intervals.